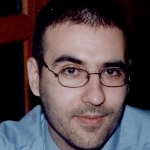 2001-2005 : PhD in Bioinformatics , Department of Biology, University of Athens. 2001-2002 : Postgraduate Certificate of Education (PGCE) in Adults Learning. Hellenic Open University. 1999-2001 : MSc in Biostatistics, Department of Mathematics and Medical School of Athens, University of Athens. 1992-1997 : BSc in Biology, Department of Biology , University of Athens. 1. Stochastic Models of Protein and DNA sequences, Hidden Markov Models, Artificial Neural Networks and Hidden Neural Networks. 2. Prediction of Protein Structure and function, Transmembrane Protein Topology Prediction. 4. Biostatistics and Applied Statistics, Longitudinal Data Analysis, Multivariate Analysis, Meta-analysis. Bagos, P.G., Karnaouri, A.C., Nikolopoulos, G.K., Hamodrakas, S.J. (2006) No evidence for association of CTLA-4 gene polymorphisms with the risk of developing Multiple Sclerosis: a meta-analysis. Multiple Sclerosis. In Press. Tsantes, A.E., Nikolopoulos, G.K., Bagos, P.G., Vaiopoulos, G., Travlou, A. (2006) Association between the platelet glycoprotein Ia C807T gene polymorphism and coronary artery disease: a meta-analysis.International Journal of Cardiology. In Press. Nikolopoulos, G.K., Tsantes, A.E., Bagos, P.G., Travlou, A., Vaiopoulos, G. (2006) Integrin, alpha 2 gene C807T Polymorphism and Risk of Ischemic Stroke: a Meta-Analysis.Thrombosis Research. In Press. Liappas, I., Piperi, C., Malitas, P.N., Tzavellas, E., Liappas, A.I., Boufidou, F., Kalofoutis, C.A., Bagos, P., Rabavilas, A., Kalofoutis, Á. (2006) Correlation of liver dysfunction biological markers to the mood status of alcohol -dependent individuals.The International Journal of Psychiatry in Clinical Practice. In Press. Liappas, I., Chatzipanagiotou, S., Nicolaou, C., Tzavellas, E., Bagos, P., Soldatos, C.R. (2006) Interrelation of Hepatic Function, Thyroid Activity and Mood Status of Alcohol-dependent Individuals.In Vivo. 20(2): 293-300. Bagos, P.G., Nikolopoulos, G., Ioannidis, A. (2006) Chlamydia pneumoniae infection and the risk of multiple sclerosis: a meta-analysis.Multiple Sclerosis. 12(4): 397-411. Bagos, P.G., Liakopoulos, Th.D. and Hamodrakas, S.J. (2005) Evaluation of methods for predicting the topology of β-barrel outer membrane proteins and a consensus prediction method. BMC Bioinformatics, 6:7. Tsirpanlis G, Bagos P, Ioannou D, Bleta A, Marinou I, Lagouranis A, Chatzipanagiotou S, Nicolaou C. The variability and accurate assessment of microinflammation in haemodialysis patients. Nephrol Dial Transplant. 2004, 19(1):150-157. Tsirpanlis G, Bagos P, Ioannou D, Bleta A, Marinou I, Lagouranis A, Chatzipanagiotou S, Nicolaou C. Exploring Inflammation in Hemodialysis patients: Persistent and Superimposed Inflammation - a longitudinal study. Kidney Blood Press Res, 2004, 27:63-70. Tsirpanlis G, Chatzipanagiotou S, Ioannidis A, Ifanti K, Bagos P, Lagouranis A, Poulopoulou C, Nicolaou C. The effect of viable Chlamydia pneumoniae on serum cytokines and adhesion molecules in hemodialysis patients. Kidney Int Suppl. 2003, 84: S72-5.